Read more fake news at The Political Garbage Chute. LAKE AMNESIA, FLORIDA -- During an interview with a Florida newspaper, former New Mexico Governor Gary Johnson reportedly couldn't name the Libertarian Party candidate. Johnson, who has been fairly roundly mocked for his recent problems identifying where in the world Aleppo is, and being unable to name a single world leader, Johnson was asked by a reporter if he thought the Libertarian Party had a problem seeming legitimate on foreign policy. "You'd have to ask the Libertarian Party candidate, man," Johnson told Helen McMackie, reporter for The South Florida Sun, "that's a question they'd have to answer." According to McMackie's reporting, she first asked Johnson if he was "pulling [her] leg." When the former governor blinked back at her and said he wasn't kidding, she asked him for his driver's license, to verify she was speaking to the real Gary Johnson. Mr. Johnson handed his driver's license to McMackie, who confirmed she was indeed speaking to that Gary Johnson. "So, you, Gary Johnson, are telling me that if I want to ask a question about the Libertarian Party, I have to ask their candidate," McMackie asked confusedly. "Um, yes, that's what I'm telling you," Johnson said, "he'd be the one to answer such a question." "But, you're Gary Johnson," McMackie repeated again. "Yes, of course, I am," Johnson replied. "And you're a part of the Libertarian Party," McMackie asked. "Abso-toot-ly I am," Johnson answered, "proud, card carrying member of the Libertarian Party, actually." Undeterred, McMackie's piece says she was "bound and determined" to get Johnson to "snap into reality." "Okay, so if you're Gary Johnson," McMackie started, "and you're a member of the Libertarian Party, and I ask you a question about the Libertarian Party's foreign policy goals...you really want me to ask the Libertarian Party's presidential candidate? Am I getting that right?" "Yes," Johnson said jovially, "that's completely correct. You gotta go straight to the horse's mouth, I always say." Ms. McMackie said she took a moment or two, and finally came up with a question that could help cut the tension and resolve the issue at hand. "Mr. Johnson," McMackie tenderly began, "um, do you even know who the Libertarian Party's presidential candidate is, by chance?" "No clue," Johnson shot back, almost immediately. Sensing that subtlety was a lost cause, McMackie brought out her smart phone. She says she opened her web browser and pointed it to the Libertarian Party's website. She showed him the front page, which features his picture and name. When she handed the phone to Mr. Johnson, he reportedly took one look, nodded up and down, and smiled. 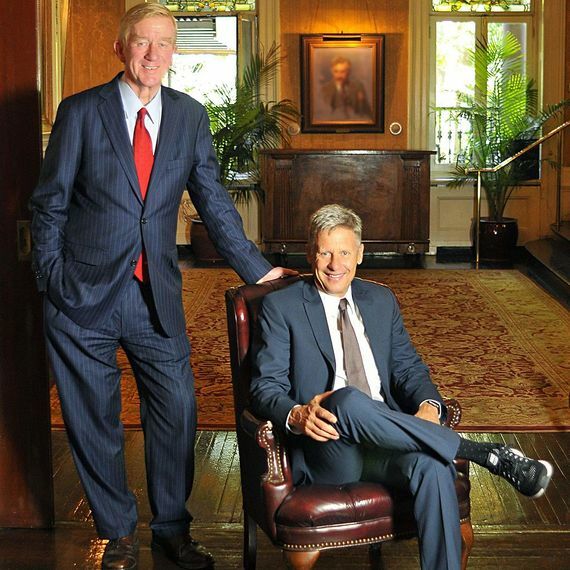 "Good looking guy," Johnson said, "who's he?" Current polling shows someone who looks and acts a lot like Gary Johnson would get roughly 4-8% of the popular vote, were the election to be held today.